From humble beginnings, Johnny Cool Darwin has grown from 3 person small business to a company with more than 40 full time staff and apprentices. Johnny Cool strive to be the best in service, with the best service people, and the best after sales service. Born out of sheer frustration from seeing the gaps in good old fashioned service and reliability in the Darwin Electrical Servicing Industry, Johnny Cool Darwin was formed in 2009 by John and Kylie Hayes. NT owned and operated business, Johnny Cool Darwin offer electrical and mechanical service and installation by a 50 strong workforce made up of electricians, refrigeration mechanics, trades assistant, project managers, qualified estimators and business qualified office staff. Johnny Cool was quick to establish itself as a reputable Service Agent for Domestic and small Commercial and Industrial Electrical works. We have a strong allegience with Fujistu and are a Gold Star service agent servicing the Darwin and surrounding area. 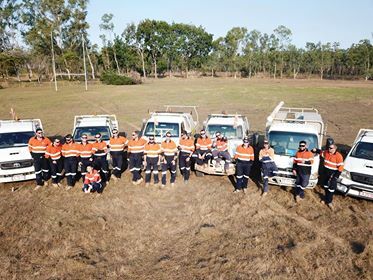 In addition to our servicing work, Johnny Cool have a loyal and knowledgable projects team that has helped the company to complete large scale construction work throughout Darwin and remote communities. See our VIEW OUR PROJECTS section to read about these. As Darwin and the Northern Territory morphs into the new 'Western Australia Resource Sector' of Australia, Johnny Cool Darwin, it's Directors, Managers and it's staff are keen to tackle the challenges that lie ahead, building on experience, resources and partnerships to continue the mission of 'best in service' well into the future. We've had a large prescence on the Inpex LNG gas plant since 2012 and continue to offer our expertise on the site. With the Australian Government investing substantial resources in the Defence and construction sectors, Johnny Cool hope to be associated with many of the projects occuring in the Top End. It's a tough life at the Top End and Director, John Hayes, Lead Foreman, Norm Harris and Project Manager, Ross Carmichael from the Johnny Cool Team took on the V8 Supercar challenge at the Hidden Valley Raceway in July this year.